The event takes place on the 30th of March starting at 19:00. 📀 #ConstantDullaart has been exploring the internet as a medium since the early 2000s. With works such as “Youtube as a sculpture” (2009) [https://youtu.be/yGvWL7Vb7I8] – a sculptural rendition of the “loading” animation on YouTube – the audience is implicated in the piece through commenting, reinterpreting and reposting it on various social platforms. 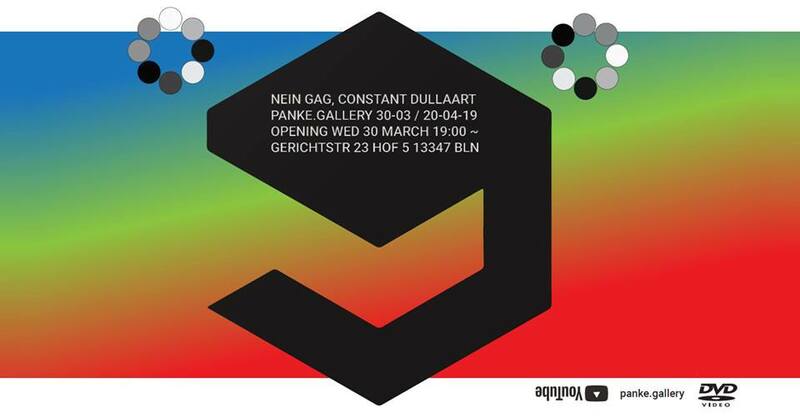 The exhibition NEIN.GAG re-contextualizes his work “DVD guy: Humans Saver” (2010) [https://youtu.be/nKLcfvpwq5c] within the Panke.gallery space.This work – a #webcam#performance – bridges the gap between two different forms of media, the #internet and the #DVD, and the reaction of the pubic has recently culminated in the creation of a popular internet meme “this DVD guy” [https://youtu.be/gBT8gdTEAg4 | https://www.instagram.com/p/BsqS7-WDjDG | https://www.instagram.com/p/BrpjyMAH0it | https://www.instagram.com/p/BrnmrMRHQku]. Constant Dullaart [https://constantdullaart.com] 📀 born 1979, leiderdorp, netherlands, lives and works in berlin and amsterdam. his practice reflects on the broad cultural and social effects of communication and image processing technologies, from performatively distributing artificial social capital on social media to complete a staff-pick kickstarter campaign for a hardware start-up called dulltech™. his work includes websites, performances, routers, installations, startups, armies, and manipulated found images, frequently juxtaposing or consolidating technically dichotomized presentation realms.